A call to Eric Trupheme at Ocean Independence brings more news of his latest central listing, the 26.2m motor yacht Aramis. Built by Italy's Falcon Yachts in 2002, she's had only one owner since new, has always been privately used and has been wintered ashore every year. Accommodation is for eight guests in a master suite, VIP stateroom and two twin cabins while two MTU 12V 2000 engines give her a cruising speed of 24 knots. 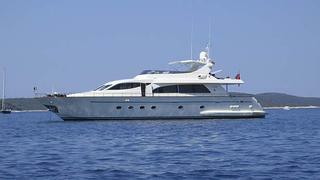 Lying in Viareggio, Aramis is asking €1.7 million, VAT paid.